Imagine sinking your teeth into a succulent piece of meat that is perfectly caramelized around the edges with a beautiful dark coating of savoury and sweet sauce. It’s been years since I had Cantonese Roasted Pork Ribs like this. I know how good it can be but the last time I had it was in a Chinese restaurant in Malaysia. And it wasn’t that great. I found this recipe while visiting Chocolate & Zucchini and she made this with a recipe from another blog, belonging to a Chinese woman who lives in France called La Bouche Plein. The recipe was written in French but thank god for Google Translate. It was worth braving the automated language translation engine – this recipe is legit. And so easy to do. I made some adjustments to the recipe because I thought garlic should play a picture in this. Note that it will undoubtedly taste better if you let your pork ribs marinate overnight but I only let mine marinate for two hours. Definitely missing out on some flavour action but it’s still very good. 1. 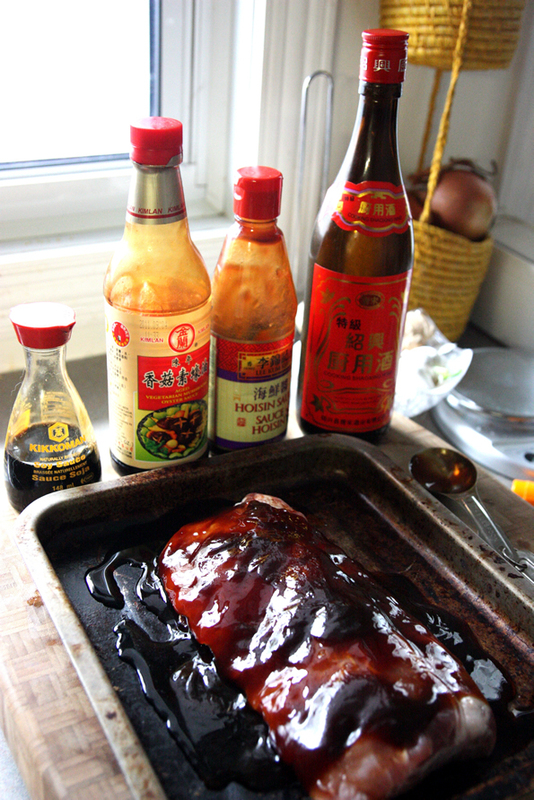 Put your pork ribs in the baking tray and pour all your marinade ingredient onto the pork ribs. With a brush (or your hands, if you roll that way), brush the marinade evenly all over the ribs. Make sure it is completely covered with the marinade. Let the pork ribs marinate in the fridge for at least 2 hours. 2. Pre-heat your oven to 400F and then reduce the heat to 350F. Take your ribs out of the fridge and make sure the bone side is down. Work the marinade around the ribs again to make sure the marinade is all evenly distributed. You’re going to pour 1/2 cup of water into the baking tray too as this will help make sure the ribs cooks evenly and the sauce doesn’t burn too quickly. Put the garlic, ginger and scallion over the ribs like a garnish and bake the ribs in the oven for 2 hours – every thirty minutes you baste it with the liquid on the tray. 3. Add 1/4 cup of water into the tray from time to time if it gets too dry from cooking. 4. 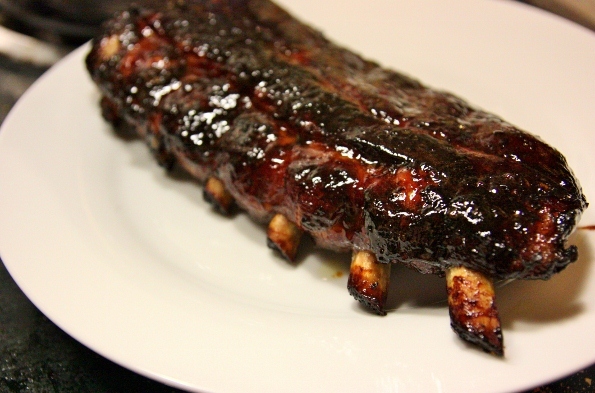 In the last 5 minutes of cooking, brush the honey over the ribs to create a beautiful glaze and finish cooking. 5. Let the ribs rest for 20 minutes before cutting it. I didn’t have any pictures of the ribs cut because my hands were sticky and the deliciousness was too much it convinced me that picture-taking was unnecessary at this point. OMG /drool that looks amazingly good. I have been hankering ribs for awhile now, I think I will try my hand at this. Nice job. I’ve used the exact method as you many times and it does work well. I alawys run into the same issue though when wrapping the ribs and adding apple juice. Even though I use heavy duty foil it is very easy to develope leaks where ever the foil kinks as you wrap them. This lead me to eliminating that step and just letting them cook for 5 hours uncovered followed by the 1 hr with sauce on them. I really couldn’t tell any difference that the wrapping/apple juice step added.